lake of shining waters: GIVING BACK....TWO GIVEAWAYS! My Birthday is March 1. I will be 52 years old, and proud of it. (most days!!). I was married in my late 20's and had all 3 of my children in my 30's. Anyway, I would like to have TWO GIVEAWAYS! 1. FOR ALL MY CROSS-STITCH FRIENDS/READERS...I WILL GET TOGETHER AN ENVELOPE OF A FEW CROSS-STITCH RELATED ITEMS. I HAVEN'T GOTTEN IT TOGETHER YET, BUT WHEN I DO I WILL EDIT FOR A PHOTO. **EDITED TO ADD PHOTO...(you will receive: The Drawn Thread "Garden Recipe" bellpull chart....Plum Pudding Needleart "Bits of Blue".....With Thy Needle and Thread "Sarah's Garden" and "Love Letters" (these two are gently used and I LOVED stitching them!! ), Elizabeth Designs "Home Sweet Home"...and two older copies of "Sampler & Antique Needlework Quarterly"...these are fantastic magazines...I bought several from a lady that was selling her MIL's stash....and you will get a skein of dinky dyes. I hope you will find something of interest in this package! I may be adding more before it's actually mailed! 2. FOR ALL MY NON-CROSS-STITCH FRIENDS/READERS....I WILL GET TOGETHER AN ENVELOPE WITH NON-STITCH RELATED ITEMS...AGAIN, I DO NOT HAVE THIS TOGETHER YET, BUT WILL POST A PHOTO WHEN I DO. **EDITED...PHOTO HAS BEEN ADDED! ** You will receive a "spring" themed envelope...socks, notecards, napkins, a dishcloth my MIL makes and a set of bookmarks......again I will most likely add more to this as I am out shopping!! IF YOU WOULD LIKE TO ENTER EITHER GIVEAWAY, PUT YOUR NAME IN THE COMMENT SECTION OF THIS POST, AND I WILL HAVE MY DAUGHTER DRAW TWO NAMES, ONE FOR EACH ENVELOPE, ON MARCH 1. PLEASE MAKE SURE YOU LET ME KNOW WHICH ENVELOPE YOU ARE ENTERING FOR! IF YOU WOULD LIKE TO POST IT ON YOUR BLOG AND A LINK TO THIS BLOG, YOU WILL GET AN EXTRA CHANCE TO ENTER. JUST LET ME KNOW THAT YOU HAVE DONE THIS WHEN YOU POST A COMMENT....GOOD LUCK!! Even though I have no idea what are in the giveaways, you can sign me up for the Stitcher's one! When you post a picture of your giveaway, I'll link it on my blog. I'm in for the cross stitch one! ooh enter me! :) happy Birthday!! Love your daughter's legwarmers. They turned out very nice. You need to post more pictures of your Swedish weaving again...show us what you are working on. :) I think those are always really pretty. Oh what fun... please enter my name in your stitcher's giveaway. What a fun idea. I may swipe it. :-) I'm up for playing. I do not cross-stitch though so put me in for the other. Thanks! HappyBirthday to you. thank you for this chance.please enter my name in your stitcher's giveaway.I am not sure I can take part. Oh this is exciting! I would like to enter your draw for non-stitchers! That is nice that we all can play! Oh Marion sign me up for the cross stitch giveaway!! I would love a little gift from my home province and one of it's loveliest residents. and HAPPY BIRTHDAY my friend. Hello sweet Marion. A Giveaway! I'm excited! Please enter me in you stitcher drawing and I want to wish you a happy birthday. I love your blog and will come visit often. I posted your drawing on my blog. count me in the cross stitch give away and a very happy birthday to you! Oh nice! I'd love to be in the cross stitch giveaway! Happy birthday! Please enter me for your cross stitch giveaway. You're very generous! I, too, turned 52 this year - welcome to the club! How cool! Happy Birthday! I just turned 56. Please enter me in the crossstitch! I would love to be included in the cross stitch giftaway drawing, Marion! Happy Birthday! Oh, I did post a link on my blog! Lovely giveaway for your birthday. Please enter me in the cross stitch one. Happy Birthday. Please add my name for your cross stitch giveaway. I will also post a link on my blog tomorrow. Thanks so much! And happy birthday! 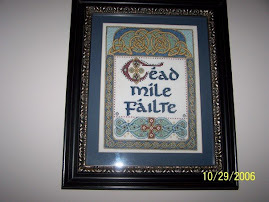 Enter me in the cross stitch give away and have a Happy Happy Birthday. Please enter me for envelope #1 for cross stitchers. Thanks and hope you have a wonderful birthday! HAPPY BIRTHDAY. A day late. Sorry. I LOVE THE HISTORY, EVEN IF IT WASN'T MINE! FIRST SNOW DAY OF THE SCHOOL YEAR! PHOTOS HAVE BEEN ADDED TO GIVEAWAY..